State Department Announces New “Long-standing” Policy Against Backing Coups | Democracy Now! A week ago Democracy Now! 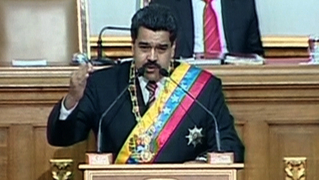 aired this short clip from a recent State Department press briefing about Venezuela. It has since gone viral. If you missed it the first time, watch it now. Click here to watch our full discussion about Venezuela with Pomona College professor Miguel Tinker Salas, author of The Enduring Legacy: Oil, Culture, and Society in Venezuela and the forthcoming book, Venezuela: What Everyone Needs to Know. JEN PSAKI: These latest accusations, like all previous such accusations, are ludicrous. As a matter of long-standing policy, the United States does not support political transitions by nonconstitutional means. Political transitions must be democratic, constitutional, peaceful and legal. We’ve seen many times that the Venezuelan government tries to distract from its own actions by blaming the United States or other members of the international community for events inside Venezuela. These efforts reflect a lack of seriousness on the part of the Venezuelan government to deal with the grave situation it faces. 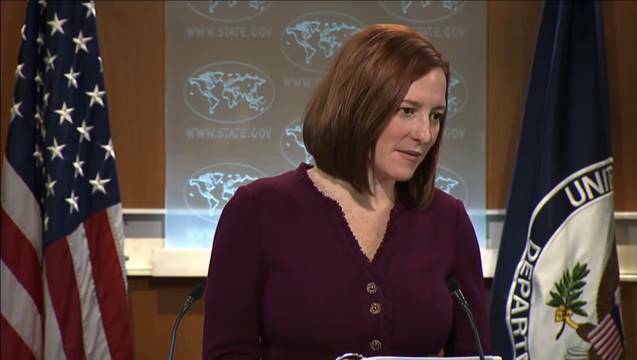 AMY GOODMAN: That was State Department spokesperson Jen Psaki being questioned by reporters. Professor Miguel Tinker Salas, if you could respond to both that exchange and also Josh Earnest, White House spokesperson? MIGUEL TINKER SALAS: I would have loved if that kind of exchange would have got broader diffusion in the U.S. press, but the fact is that it hasn’t. And we continue to have the belief that the U.S. does not—is not involved in unconstitutional change in Latin America. And as a historian, the record speaks just the opposite, from ’53 in Guatemala to the Dominican Republic, to Chile in ’73, and through the support of the Argentine military dictatorships and Brazil, and, if we want to go even closer, to 2002 in Venezuela, when the U.S. actually did support a coup against the democratically elected Hugo Chávez, the shortest coup in the world, and the coup that brought Chávez back to power, and then again in Honduras in 2009, and, not shortly thereafter, in Paraguay with Lugo, where they said it was a democratic transition, when in fact it was an unconstitutional shift in power. So, again, the notion that the U.S. has not supported both military coups directly or through what they call soft power is really ludicrous. And, in fact, we should turn the question around. If they want to support democracy, I think the best thing the U.S. can do in the case of Venezuela and other countries is to pull back and let things develop on their own. I think you have a very strong opposition in Venezuela. It can speak for itself. You have a government force and other social forces that are organized in those countries. And I think the best thing, in the case of Mexico and in the case of Venezuela, is for the U.S. to stop intervening.